Put a gear on it. Recently, I had the pleasure of attending the New York 19th century Society Extravaganza, an event that brought together history nerds and Steampunk fans from all around the city. Steampunk plays with the idea of an evolved Victorian era; some describe it as the past if the future had come sooner. It’s historical as well as fantastical and the movement is largely based in a fiction genre. But it’s become a highly visual movement as well, focused on costumes, artisanal jewelry and other accessories. The clothes are crazy chic. I enjoy the Steampunk folks, because they’re doing something I often play with on my blog: not recreating the past, but looking to history for inspiration to create something entirely new. The point of the Extravaganza was the push the history connection. Participates could attend a bevy of free classes on historical subjects as well as visit historic sites. Victorian food merged w/ molecular gastronomy. Spherified figgy pudding? Black pudding dust? An English breakfast terrine? Gear-filled tartlettes; whole boiled potatoes; green glowing plasma. I think a good tea, the dinner kind, with toast and cheese, such as an adventurer or tinkerer might enjoy. Nothing green. Photosynthesis rarely happens in steampunk scenarios because the technology almost always creates environmental pollution and either blocks out the sun or drives people underground or to ocean. I always envision a diet of potatoes and tuber veggies. I think the cooking method is always heavy steaming or an unconventional open high heat source like a radiator, batteries or butane lighters. The foodstuffs would be highly preserved like pickled radishes and cured meats. I think steampunk embraces the innovative and transformative, the implications of a super science without limits. Food that has those aspects in preparation, presentation, or taste seems to fit. Surprises, doing something completely unexpected with the available tools and parts. The more impossible seeming the better. I chose popcorn since it’s transformation is itself so remarkable. Toast actually has that kind of feel, bread slices vanishing into a metal box with two narrow slots to be returned with a new texture and taste. Things that can be flambed in creative ways. Anything steamed and steamable, especially at the table. Pressure cooking. So what do you think? What is Steampunk food? I definitely agree with you about cooking methods. A lot of things would be in sealed pots to prevent them from getting the coal flavor. I believe they talked about this on a BBC program – either The Victorian Farm or The Edwardian Farm. However, I don’t think that there would be a lack of fresh vegetables. Most steampunk concentrates on the cities, but that doesn’t mean the world would be one big city, just that fewer people would live in rural areas. As today, most farming would be done by machine. Still, just as today, you don’t need to have the tractors out every day. However, with steampunk conveyances, things would be easily transported. This would allow for more out of season foods as it does today, or at least as it did in the Edwardian era, as is shown in The Edwardian Farm, where they are growing strawberries, etc. in Devon for market in London and Edinburgh, transported via train. The bottom had dropped out of the British wheat market and mutton market thanks to the ease of imports from America and New Zealand, and I think similar things would have happened in a steampunk world. I think there would be lots of mechanization – from automats to blenders. Can you imagine an industrial kitchen with belts hanging from the ceiling to operate the mixers, like in an old machine shop? Finally, although they might not have refrigerator trucks and the kinds of chemicals we use today to ripen fruits and veggies, they would at least have the kind of technology the Victorians used in their walled gardens to extend seasons, as seen in the show The Victorian Kitchen Garden. oo, I love the idea of a steampunk automat. The source material for steampunk — people like H.G. Wells and Jules Verne — often talk about food. Dr. Moreau, before he started experimenting on animals, grows asparagus spears the size of small trees, and Nemo goes on a great length about underwater “ranching” and the versatility of various sea vegetables. I suggest you do some research on Marinetti and the Italian Futurists as they had menus and dining ideas which were quite “involved”. They also had nice artwork too. Yess! Actually, there is a “Futurist’s Cookbook,” that I’ve tried to hunt down. But it’s not online and it seems incredibly rare. lots of $$ for hard copies. 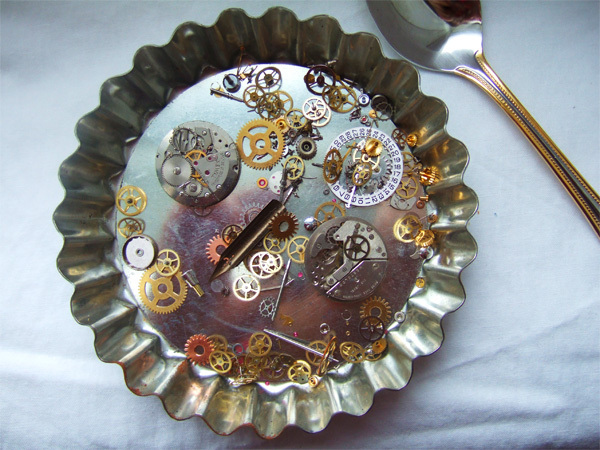 All seriousness aside, any casual observer of the steampunk world can tell you that the picture you used nails it–it’s food with lots of extra gears in it. Yeah! Put a Gear on it! Hilarious! Yes, it seems there can be a steampunk aesthetic to the cookware if not the food. I love the idea of steampunk food, and I have been entirely unable to come up with anything good so far, short of renovating the kinds of lovely savory snacks that go with a workingman’s tea. Right?? That’s why I had to ask the internet at large, because I was stumped. But now, I’d love to do a steampunk dinner!